How Everett Program students–with the help of alum and Executive Fellow Monica Gutierrez-Lopez–apply skills learned in the classroom to the community through “impactathons," hackathon-style events intended to make a social difference. Monica Gutierrez-Lopez, a first-generation UC Santa Cruz alum, is currently working as an Impactathon Executive Fellow at the Everett Program. The Everett Program is a student-managed digital innovation lab that combines skills in technology with social entrepreneurship. Photo by Melissa De Witte. “Impactathons provide a space for personal and professional growth that I didn’t get out of a typical classroom experience,” says Gutierrez-Lopez. She is able to expand her technology expertise while also mastering skills in leadership, community organizing, and critical listening. ﻿Gutierrez-Lopez hosted two impactathons when she is was in Nigeria. One impactathon was working with the criminal justice organization Cleen Foundation to create maps and graphics; and the other was a leading a social media workshop with democratic advocacy group The Yar'Adua Foundation. Photo by Monica Gutierrez-Lopez. 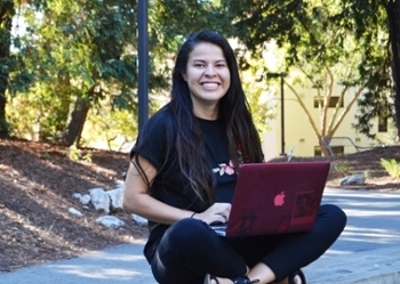 “I never thought I had the capacity to do the type of work that the Everett Program does,” says Monica Gutierrez-Lopez, a first-generation UC Santa Cruz alum who is currently working with the program as an Impactathon Executive Fellow. “The Everett Program means a lot to me,” says Gutierrez-Lopez about the student-managed digital innovation lab that combines skills in technology with social entrepreneurship. It was at UC Santa Cruz where Gutierrez-Lopez found her home, and through the Everett Program where she discovered her sense of self. Gutierrez-Lopez was born in Mexico and attended school in Hanford, a small agricultural town in California’s Central Valley. “I never even thought I was going to go to college,” shares the recent graduate (sociology ’17, Cowell). 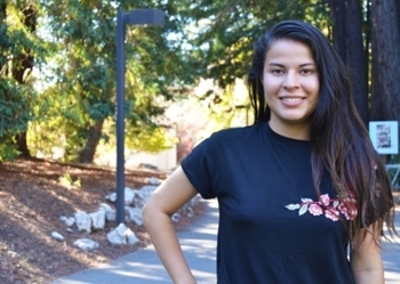 Now, she is enriching the college experience for the next wave of UCSC students as an Executive Fellow, a unique position for a recent graduate to facilitate programming for the Everett Program. She is also sharing what she learned at the Everett Program to others: for her capstone project, Gutierrez-Lopez spent the summer in Nigeria training Muslim women tech skills to support their small businesses and provide job opportunities. Gutierrez-Lopez served as a Fellow before her cohort voted her an Executive Fellow for the 2017-18 school year. To become a Fellow, students must complete the SOCY 30 Series, a year-long interactive module that teaches practical skills such as communications, social media, website building, relationship management, information gathering, field methods, project evaluation, and fundraising. The skills Fellows learn in the classroom are immediately put to use in the community. They work on mini-projects and help run impactathons, a part of the program that Gutierrez-Lopez now facilitates in her position as an Executive Fellow. Impactathons are an immersive day or weekend-long event where 10 to 16 collaborate with a nonprofit to create a product or communications tool. “Impactathons bring enthusiastic students together to solve organization needs and support community development to leverage social impact," says Gutierrez-Lopez. For example, at an Impactathon students could be producing a promotional video, like what Gutierrez-Lopez organized for Center for Amazon Community Ecology (CACE), a social enterprise that supports indigenous artisans living in the Peruvian Amazon. Or it could be creating a set of educational materials about a critical social issue, which is what the Everett Program did with the Salinas nonprofit MILPA during the 2016 election. Or it could be partnering with faculty members who needs graphics for a research project, like what the Fellows did for sociology professors Steve McKay and Miriam Greenberg’s study on the housing crisis in Santa Cruz, No Place Like Home. “One critical value of impactathons is that it helps break down barriers to technology access for those who have been historically marginalized from tech access,” says the program’s Executive Director Chris Benner. “Our students are 77% women, 72% students of color, and 54% first-generation college students. This experience is a real strength in working with our community partners," adds Benner. When Everett Program students host an impactathon, technology and social good converge. At an impactathon, it’s all hands on tech: every one learns from each other. “Impactathons provide a space for personal and professional growth that I didn’t get out of a typical classroom experience,” Gutierrez-Lopez describes. She is able to expand her technology expertise while also mastering skills in leadership, community organizing, and critical listening. But Impactathons are more than just an intense weekend where productive work happens. They also provide opportunities for students to teach and train organizations the skills at the heart of the Everett Program: social entrepreneurship. “We make sure that organizations are able to continue creating, changing, tweaking, and adapting the product we create with them,” says Gutierrez-Lopez. Not only is change immediate, its impact is also long-term. “Sustainability is crucial,” says Gutierrez-Lopez. In fall quarter, Gutierrez-Lopez is organizing six impactathons and is planning over a dozen more in 2018 with local and international groups. Gutierrez-Lopez even hosted two impactathons when she is was in Nigeria. One was working with the criminal justice organization Cleen Foundation to create maps and graphics; and the other was a leading a social media workshop with democratic advocacy group The Yar'Adua Foundation. “After hosting the impactathon at The Yar'Adua Foundation, an attendee came up to me and said she wants to teach what she learned to her daughter,” recalls Gutierrez-Lopez. As part of UC Santa Cruz’s “Fall Into Philanthropy” crowdfunding campaign, the Everett Program is raising funds to support the future of the Impactathon Executive Fellowship. Find out more on their crowdfunder page. The crowdfunder ends Nov 15. Missed the deadline to give? You can still support an Everett Executive Fellow. Find out more on the Everett Program website.